Biochar was evaluated for its effectiveness as a manure lagoon cover. It could have a future use as a nutrient-rich soil amendment. Photo credit Brian Dougherty. Manure can be a useful fertilizer, returning valued nitrogen, phosphorus and potassium to the soil for plant growth. But manure has problems. Odour offensiveness, gas emissions, nutrient runoff, and possible water pollution are just a few. Timing is also a problem. Livestock produce manure 24/7 – even when it is impractical or unwise to move it to the field. Delivering manure to the field needs to be timed to nutrient needs, soil moisture levels, and temperature. Manure storage lagoons can hold the manure until the time is ripe, but don’t solve odour and harmful gas emissions. To address these problems, scientist Brian Dougherty and colleagues researched methods to reduce lagoon odour and gas emissions using biochar covers. In addition to its hidden storage capacity, the surface of the biochar tends to have a chemical charge. This gives biochar the ability to attract and hold nitrogen, phosphorus, and potassium ions, metals, and other compounds. Biochar can also float (some types more than others), allowing it to trap gases at the water’s surface. Dougherty’s research studied two liquid dairy manures with differing nutrient levels. It also studied two types of biochars, made at different temperatures. Biochar is somewhat fickle, showcasing different properties when created at different temperatures. Dougherty also included pails of manure with a straw cover for comparison, and pails with no cover as a control. The research found that the biochars picked up the most nutrients from the more concentrated manure with a higher nutrient content. Nitrogen, phosphorus and potassium are nutrients with the greatest economic value on a farm, but applying them in excess of what the crop can take up can lead to nutrient loss to the watershed. Ammonia was also measured at the top of each pail as ammonia and sulfates are the main sources of manure odour. The cooler-crafted biochar performed best, reducing ammonia by 72% – 80%. It also floated better. 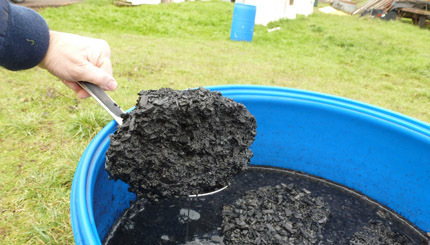 However, since it floated better and tended to repel water, it was less effective at attracting and holding nutrients than the warmer-crafted biochar. 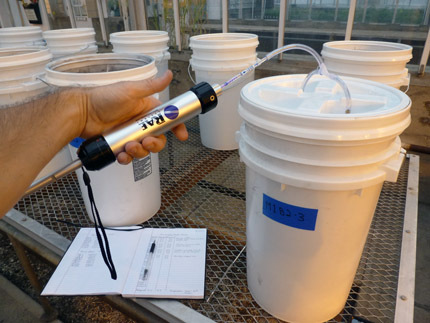 As part of the experiment, gas release from manure covered in different materials was measured in a temperature-regulated greenhouse. Photo credit Brian Dougherty. To test how biochar improved lagoon odour, Dougherty recruited a panel of judges. However, freezing temperatures and rain affected the odour intensity over the 12 week trial. Despite this, three different biochars were shown to reduce odour from liquid dairy manure, whereas a straw cover was not effective. While biochar is currently more expensive than straw, it could offer other economic benefits. Excess farm and forestry material could be used to create biochar on-site, while generating energy that could be used for heat during colder months. There is also potential for generating electricity, fuels, and other by-products using more sophisticated equipment. Also, after its use in the lagoon, the biochar could be spread on fields as needed. Any excess could be sold as a high-value fertilizer product. Dougherty’s biochar research is published in Journal of Environmental Quality. Oregon State University’s Agriculture Research Foundation and Agricultural Sciences Bioenergy Education Program funded this research. Article originally published by the American Society of Agronomy. Click here to read the original article. and the difference between use of biochar and cleaned-pulverized coal is…? I suppose cost. Biochar is way cheaper than cleaned-pulverized coal.